A listener is a component that shows the results of the samples. 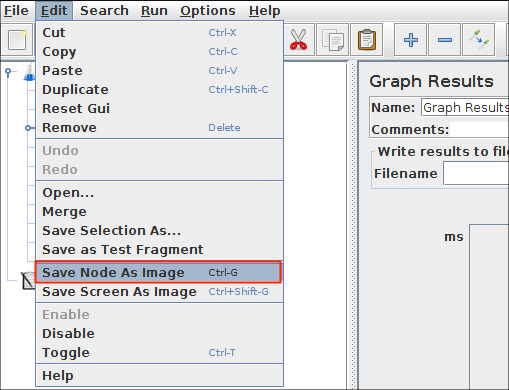 The results can be shown in a tree, tables, graphs or simply written to a log file. To view the contents of a response from any given sampler, add either of the Listeners "View Results Tree" or "View Results in table" to a test plan. To view the response time graphically, add graph results. The listeners section of the components page has full descriptions of all the listeners. Different listeners display the response information in different ways. However, they all write the same raw data to the output file - if one is specified. The "Configure" button can be used to specify which fields to write to the file, and whether to write it as CSV or XML. CSV files are much smaller than XML files, so use CSV if you are generating lots of samples. The file name can be specified using either a relative or an absolute path name. Relative paths are resolved relative to the current working directory (which defaults to the bin/ directory). JMeter also supports paths relative to the directory containing the current test plan (JMX file). If the path name begins with "~/" (or whatever is in the jmeter.save.saveservice.base_prefix JMeter property), then the path is assumed to be relative to the JMX file location. If you only wish to record certain samples, add the Listener as a child of the sampler. Or you can use a Simple Controller to group a set of samplers, and add the Listener to that. The same filename can be used by multiple samplers - but make sure they all use the same configuration! The default items to be saved can be defined in the jmeter.properties (or user.properties) file. The properties are used as the initial settings for the Listener Config pop-up, and are also used for the log file specified by the -l command-line flag (commonly used for CLI mode test runs). The information to be saved is configurable. For maximum information, choose "xml" as the format and specify "Functional Test Mode" on the Test Plan element. If this box is not checked, the default saved data includes a time stamp (the number of milliseconds since midnight, January 1, 1970 UTC), the data type, the thread name, the label, the response time, message, and code, and a success indicator. If checked, all information, including the full response data will be logged. The following example indicates how to set properties to get a vertical bar ("|") delimited format that will output results like:. expected to contain: password etc. The full set of properties that affect result file output is shown below. # This section helps determine how result data will be saved. # legitimate values: xml, csv, db. Only xml and csv are currently supported. # where the fields' values are separated by specified delimiters. # Optional list of JMeter variable names whose values are to be saved in the result data files. # so the names must be valid XML names. # to ensure that the correct data is available at the client. Matching is now also strict (non-lenient). JMeter 2.8 and earlier used lenient mode which could result in timestamps with incorrect dates (times were usually correct). JMeter supports the sample_variables property to define a list of additional JMeter variables which are to be saved with each sample in the JTL files. The values are written to CSV files as additional columns, and as additional attributes in XML files. See above for an example. Listeners can be configured to save different items to the result log files (JTL) by using the Config popup as shown below. The defaults are defined as described in the Listener Default Configuration section above. Items with (CSV) after the name only apply to the CSV format; items with (XML) only apply to XML format. CSV format cannot currently be used to save any items that include line-breaks. Note that cookies, method and the query string are saved as part of the "Sampler Data" option. When running in CLI mode, the -l flag can be used to create a top-level listener for the test run. This is in addition to any Listeners defined in the test plan. The configuration of this listener is controlled by entries in the file jmeter.properties as described in the previous section. Note that JMeter logging messages are written to the file jmeter.log by default. This file is recreated each time, so if you want to keep the log files for each run, you will need to rename it using the -j option as above. JMeter supports variables in the log file name. If the filename contains paired single-quotes, then the name is processed as a SimpleDateFormat format applied to the current date, for example: log_file='jmeter_'yyyyMMddHHmmss'.tmp'. This can be used to generate a unique name for each test run. Listeners can use a lot of memory if there are a lot of samples. The following Listeners no longer need to keep copies of every single sample. Instead, samples with the same elapsed time are aggregated. Less memory is now needed, especially if most samples only take a second or two at most. To minimize the amount of memory needed, use the Simple Data Writer, and use the CSV format. <httpSample t="1392" lt="351" ts="1144371014619" s="true"
<httpSample t="170" lt="170" ts="1144371015471" s="true"
<httpSample t="200" lt="180" ts="1144371015641" s="true"
<responseData class="java.lang.String"><!DOCTYPE html PUBLIC "-//W3C//DTD XHTML 1.0 Transitional//EN"
<sample t="0" lt="0" ts="1144372616082" s="true" lb="Example Sampler"
Note that the sample node name may be either "sample" or "httpSample". The format of the JTL files is identical for 2.2 and 2.1. Format 2.2 only affects JMX files. JMeter allows additional variables to be saved with the test plan. Currently, the variables are saved as additional attributes. The testplan variable name is used as the attribute name. See Sample variables (above) for more information. As shown above, the response data can be saved in the XML log file if required. However, this can make the file rather large, and the text has to be encoded so that it is still valid XML. Also, images cannot be included. Only sample responses with the type TEXT can be saved. Another solution is to use the Post-Processor Save_Responses_to_a_file. This generates a new file for each sample, and saves the file name with the sample. The file name can then be included in the sample log output. The data will be retrieved from the file if necessary when the sample log file is reloaded. To view an existing results file, you can use the File "Browse…" button to select a file. If necessary, just create a dummy testplan with the appropriate Listener in it. Results can be read from XML or CSV format files. When reading from CSV results files, the header (if present) is used to determine which fields were saved. In order to interpret a header-less CSV file correctly, the appropriate JMeter properties must be set. JMeter does not clear any current data before loading the new file thus allowing files to be merged. If you want to clear the current data, use the menu item: Run → Clear (Ctrl + Shift + E) or Run → Clear All (Ctrl + E) before loading the file. JMeter is capable of saving any listener as a PNG file. To do so, select the listener in the left panel. Click Edit → Save Node As Image. A file dialog will appear. Enter the desired name and save the listener. The Listeners which generate output as tables can also be saved using Copy/Paste. Select the desired cells in the table, and use the OS Copy short-cut (normally Ctrl + C). The data will be saved to the clipboard, from where it can be pasted into another application, e.g. a spreadsheet or text editor.